Hanging Man: “Like a pre-born infant in the womb, reversing itself to prepare for passage out of the state of suspended animation of one world and into the next, Hanging Man is observing reality from an inverted perspective. 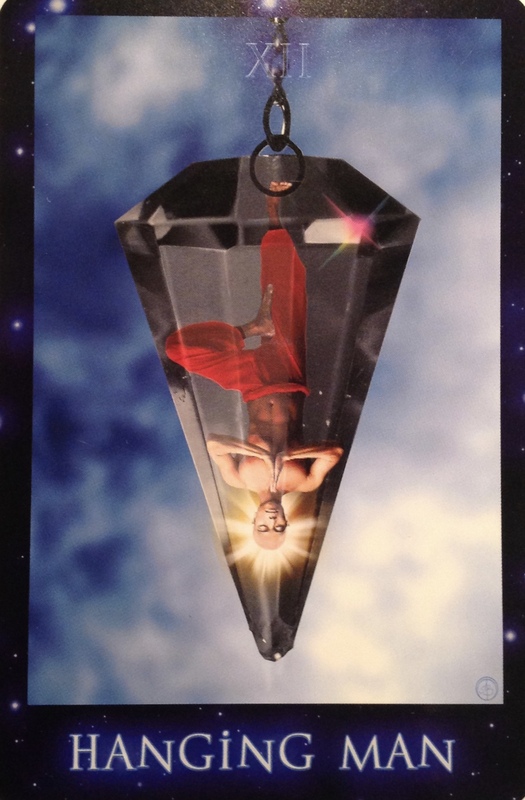 He is the stilled pendulum, at rest: a potential energy disengaged, floating, meditating, surrendering. Starseed is confronted with the possibility that there will be times on the path when she or he will need to look at things from a different perspective. There will be epiphanies, when reversals will bring opportunities to be reborn. Sacrificing one’s position on an issue and looking at it from another direction may bring enlightenment. Hanging Man appears to be waiting to be reborn, as many of us describe it, into a new spiritual consciousness. He (or she) is on a vision quest, opening to an altered state of awareness, experiencing new insights. This key is associated with meditation, selflessness, new perspectives, reversal of ideas, silence, stillness. We have been working hard on ourselves, particularly over these last few days. We have been bringing the shadows into the light. Shedding all the those old layers. Building ourselves back up with more love and light than we ever thought possible. We are surrendering to the Divine plan. And now, we are being asked to throw away the remnants of all of our outmoded belief systems. This includes releasing all vestiges of old limitations that we may have set up to protect ourselves, or we may have had projected upon us by others and have continued to honour unnecessarily. We no longer need to be protected from ourselves. We must move forward with a new perspective about what is possible. Every morning and every night ask that you be filled with as much light as you can possibly hold in your physical body at this moment in time. By doing this, you allow your cells to be flooded with Light. Each time you ask, you will receive. Each time you will receive more than the last. You will raise your vibration and you will change your physical form as you do so. You will literally become Lighter. You can also ask to be filled with the high vibrational resonance of joy, love and happiness, even ecstasy. By the Grace of the Universe. Turn off your television and step back from the drama to heal yourself for as you do so, you heal those around you and the planet. Take time to meditate. Take time to incorporate deep breathing into your day as this is the bridge to the higher dimensions. Drink more pure water. Eat Lighter, plant based foods. Get outside every day. Incorporate music for the purpose of healing and uplifting. These rituals will assist you in shifting your perspective. They will purify you, body, mind and spirit and quantum jump you into ascension. With a brand new perspective of just what is possible.